Back in the day, a royal would never have married someone outside his or her social circle—it simply wasn't done. Nowadays, however, marrying a non-royal seems to be more common. From Will and Kate, to 11 American women who became princesses (and even, in some cases, queens), here is a list of royals who chose love outside of their blue-blooded lineage. Here's to hoping that Harry and Meghan follow in their footsteps! The modern Cinderella story. The couple met in 2001 at St. Andrews University in Scotland, where Kate and William studied art history and geography, respectively. After a brief split in early 2007, the couple got back together in time for Kate to attend the Concert for Diana in July. In October 2010, William proposed to Kate in Kenya. The world heard Kate speak for the first time a month later during their engagement announcement. Their wedding in April 2011 had an audience of over 2 billion around the globe, ending with the couple being given the titles of Duke and Duchess of Cambridge. Follow their work (and see more photos of Prince Harry) on their official Instagram account! She stunned Hollywood when she married into Monaco's royal family. But did you know the wedding might not have happened if Grace Kelly hadn't changed her mind? According to an article by People, the actress nearly skipped a photoshoot with the prince. Actor Jean-Pierre Aumont encouraged her to go, and the rest is history. The couple met back in 2000 when Charlene visited Monaco for a swimming competition (she represented South Africa in the 2000 Olympics in Sydney!). They made their official debut as a couple at the 2006 Winter Olympics in Turin, Italy. A former journalist for Bloomberg and CNN+, Letizia broadcasted live from ground zero during the 9/11 attack on New York and covered the Iraq war in 2003. She was covering the oil spill along the Galicia shoreline in 2002 when she met then Prince Felipe, who was visiting the victims of the natural disaster. Despite being a divorcée, the Catholic Church did not require Letizia to have an annulment because her first marriage involved a civil ceremony. Before marrying her king, Rania worked in marketing for Citibank, and later took a job at Apple in Amman. But it was truly love at first sight for this royal couple. Barely six months after meeting at a dinner party (thrown by his sister! ), they married in a lavish ceremony in 1993. The queen is a known advocate for women's rights, early education, and community empowerment. As "a mum and a wife with a really cool day job", she is an avid user of social media. Check out her Instagram page, Twitter profile or YouTube channel! With several mutual friends, you'd think that Prince Carl Philip would have met the Swedish model and ex-reality TV star much earlier. Instead, the couple reportedly met at a restaurant in 2010. They married in 2015, and are currently expecting a second child in September 2017. In 2010, Princess Sofia co-founded the charity named "Project Playground" that assists underprivileged children in South Africa. Following in her family's footsteps, Princess Madeleine chose to marry outside nobility. After her failed engagement to lawyer Jonas Bergström in 2009, the princess married American-British financier Christopher O'Neill in 2013. Christopher is currently untitled—all members of the Swedish Royal Family must hold Swedish citizenship, and he declined in order to remain a private citizen and continue his career in finance. As heiress to the throne, some folks expected Crown Princess Victoria to marry royalty. But in this fairytale role reversal (where royal girl meets normal guy), Victoria chose to marry her personal trainer instead. After their marriage in 2010, Daniel was given the titles "Prince Daniel" and "Duke of Västergötland" (Prince + Given name + Duke of [Place], following the style of previous Swedish princes). Marrying a non-royal runs in the family, at least for the Swedes (check their Instagram account for proof!). The royal couple met during the 1972 Summer Olympics, where Silvia was working as an interpreter and educational host. They married in 1976, the first marriage of a reigning Swedish monarch since 1797. If Carl Gustaf had married Silvia during the reign of his grandfather, King Gustaf VI Adolf, he would have lost his position as heir-apparent to the Swedish throne, for the King believed that royalty must marry royalty. Fun fact: As an interpreter, Swedish is actually the queen's 6th language. She also speaks fluent German (she was born there), her mother's language of Portuguese, as well as French, Spanish, and English. Although it's never been verified, King Jigme allegedly first met Jetsun when she was 7 years old and he was 17 at a family picnic in Thimphu. He told her that if she was still single and he was still single when she grew up, he would like to marry her. In 2011, they tied the knot in a televised celebration (a big deal since TV was banned in Bhutan until 1999). The king also gave his bride a history-making kiss on the lips—the crowds loved it, despite Bhutan's conservative values. 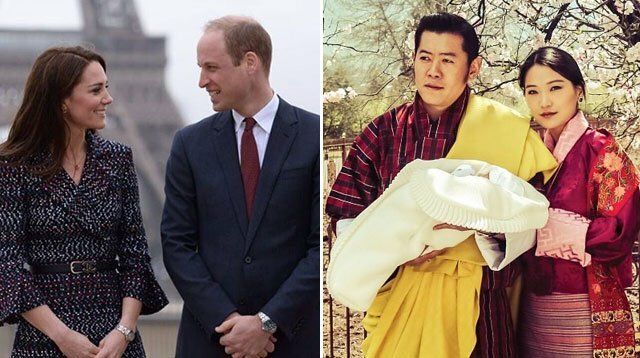 Fun fact: The King's younger brother, prince Jigme Dorji Wangchuck married Yeatso Lhamo in 2013. She is the elder sister of current queen Jetsun Pema. The king has also declared that despite tradition, Jestun will be his only wife (his father has four wives). Tokyo held a reception for visiting Spanish princess Elena in 1986. It was during this event that Masako crossed paths with Crown Prince Naruhito. The prince was smitten and tried to court her, but Masako decided to pursue a two-year study at Oxford as part of an assignment from the Foreign Ministry instead. Three proposals later, and the couple eventually married in 1993. The couple met when they were both undergraduate students at Gakushuin University, and were married in 1990. Their son Prince Hisahito is the current heir to the Imperial throne unless Crown Prince Naruhito produces a male heir, or the succession laws are changed. Following her 2005 marriage, Princess Nori left the Imperial Family and became known as Mrs. Sayako Kuroda, having adopted her husband's surname; Yoshiki is the first non-aristocratic commoner to marry an Imperial Princess. The Imperial Household Law of 1947 requires females of the Imperial Family to "relinquish their title from birth, official membership in the Imperial Family, and allowance from the state upon marriage". In 1957, then Crown prince Akihito met his future wife on a tennis court in Karuizawa. During that time period, many assumed that the Japanese monarchy would choose a bride from court nobility to be their princess. Despite public support, it was rumored that Empress Kojun did not approve of Michiko, due to her common background and Roman Catholic family. When she married Akihito in 1959, Michiko became the first commoner to marry into the Japanese Imperial family. In the late 1990s Mette-Marit attended the Quart Festival, Norway's largest rock festival, in her hometown of Kristiansand. It was there that she first met Crown Prince Haakon at a garden party. Years later, she met the prince again and they quickly hit off. Although their courtship was not without controversy (she was a single mother with a young son, and had a history of drug abuse and heavy partying) King Harald V supported his son's relationship, perhaps due to his own struggles with marrying commoner Sonja Haraldsen. The couple were married in 2001 and have three children together. Sonja first met then prince Harald in 1959. Although they had dated for over nine years, the couple kept their relationship a secret due to Sonja's non-royal status. In 1968 the Crown Prince told his father King Olav V that he would remain unmarried for life unless he could marry Sonja. This would have ended his family rule, and likely the Norwegian monarchy, as Harald was the sole heir to the throne. The couple were wed in 1968, and in 2005 Sonja became the first queen to visit Antarctica. Learn more about the Norwegian royal family on their official Instagram account. Another royal family with multiple generations of "outsider" marriages, the then-Crown Prince met his princess during the 1999 Seville Spring Fair in Spain. Then–vice president of institutional sales at New York City’s Deutsche Bank, Maxima had no idea he was a prince, and thought he was joking when he finally told her the truth. In 2013, Willem-Alexander became the country's first king in 123 years when his mother, Queen Beatrix, abdicated the throne. Mabel met Prince Johan Friso through their mutual friend Laurentien Brinkhorst (she later on married the prince's brother, Prince Constantijn). After the Prime Minister discovered that Mabel had a romantic relationship with a known drug lord while in college, the Dutch government refused to submit their marriage for parliament's approval. Prince Johan gave up his right to the throne and the couple married in 2004, despite the drama. In 2012, Johan was buried under an avalanche in Austria while skiing. He fell into a coma and died of complications in 2013. Despite the fact that Greece hasn't been a monarchy since 1974, members of the royal family were allowed to keep their titles. The marriage of Crown Prince Pavlos and Marie-Chantal united European nobility and American money, and their five children have names straight out of Greek history: Olympia, Constantine, Achileas, Odysseas, and Aristidis. In 2003, Swiss-raised and Venezuela-born (with a German mother and Slovenian father), Tatiana seemed destined for an exotic life. In 2003, she was working as an event planner for fashion designer Diane von Fürstenberg. While on a ski vacation, a mutual friend introduced her to prince Nikolaos. They married in 2010 and live mainly in Greece. Born and raised in Australia to Scottish parents, Mary met "Fred" at the Slip Inn, a pub in Sydney, during the 2000 Summer Olympics. She only found out his real identity during their courtship. Before their 2004 wedding, Mary agreed to learn Danish, give up her Australian citizenship, and convert from her Presbyterian faith to the Danish Lutheran Church. Marie first met Prince Joachim at a mutual friend's party. With a successful career in marketing, she was at first reluctant to accept the prince's affections. “I had a great life – I didn’t need to be rescued by some prince from Denmark,” she said. The increased public attention certainly didn't help, but eventually love conquered all and the couple wed in 2008. Marie is also stepmother to the prince's two sons from his first marriage. In 1965, then princess Margrethe was studing at the London School of Economics and Henri was working for the French Foreign Affairs ministry. Supposedly the two met at a dinner party, but only really got to know each other while attending a friend's wedding. When he married then Princess Margrethe in 1967, Henri converted to Lutheranism and his name was Danicised to Henrik. In 2016 an official statement from Denmark's Royal Palace confirmed that Prince Consort Henrik had decided to retire and take up the less formal title of Prince Henrik. And in what seems to be a growing trend, the Danish royal family have also joined social media with their own official Instagram account. Maria Teresa was born in Havana, Cuba. She met then-prince Henri at the Graduate Institute of International and Development Studies in Geneva. For four years they took similar political science classes, and married in 1981 after Henri's father Grand Duke Jean gave his consent. The Grand Duchess was appointed UNICEF Eminent Advocate for Children in 2007, and is fluent in multiple languages: her first language is Spanish but she is fluent in French and English. She also speaks Luxembourgish, German, and Italian. Born in Germany, Claire met prince Félix while studying at international boarding school Collège Alpin International Beau Soleil. They also went on to complete degrees in bioethics at the Pontifical University Regina Apostolorum in Rome. The happy couple had two weddings in 2013—a civil ceremony in the bride's home country to continue tradition, and a religious wedding in the south of France.